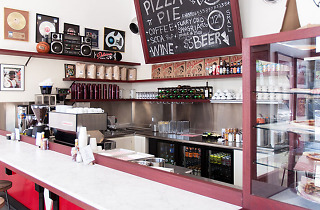 If you're a fan of pizza and hip-hop, this is your kind of neighborhood joint. Founded by father-and-son pair Fred and Travis Sutherland, alongside Delicious Vinyl founder Mike Ross and his brother, Rick Ross, the West Adams outpost combines an undeniable passion for music and tasty pies. Golden-era hip-hop memorabilia hangs from the walls, while the menu items read like a record of old school hits like the "Cheeba Cheeba" pizza topped with mushrooms, sopressata, pesto, mozzarella and fontina cheese. Order up a signature pie or build your own pizza. Salads, sandwiches and dessert are also on offer (Nutella cheesecake, anyone?). No matter what you decide, one thing is for certain: you can bet old school hip-hop tunes will be bumping out of the speakers. Delicious Pizza's name is straightforward and to the point. The pizza is really delicious. They have a range of options for meat eaters and vegetarians. Beyond having an amazing mix of dough, pizza, and toppings, the spot has an effortlessly cool vibe. That's probably because the owners of Delicious Pizza are effortlessly cool from their years in the music industry. They also do several parties, including a really fun block party around Labor Day weekend--you don't want to miss them. If there's anything major happening on TV, their back dining room likely has it on. This is an ultimate neighborhood spot and you won't regret visiting. Note: they love their arugula here so some pizzas come topped with lots and lots of arugula.